There’s a new bone of contention between India and China, and it’s water. The Indian government is concerned that the hydroelectric power projects planned in Arunachal Pradesh may be affected by China’s plan to divert water from rivers that flow into the Brahmaputra river to the arid zones of Xinjiang and Gansu. India’s ministries of water resources and power have expressed their reservations over China’s ambitious $62 billion (Rs2.9 trillion) south-north water diversion scheme as Arunachal Pradesh alone, among the north-eastern states, has a potential to generate 50,328MW of hydropower—the highest in the country, according to the Central Electricity Authority, India’s apex power sector planning body. China and India, the world’s fastest growing major economies, have been sniping at each other over border issues, including the status of Arunchal Pradesh, an Indian state that China claims. Tensions have also risen after articles in the Chinese media criticizing Indian policy regarding Arunachal Pradesh. The firms that are developing hydropower projects in Arunachal Pradesh include state-run NHPC Ltd, Reliance-Anil Dhirubhai Ambani Group (R-Adag)-owned Reliance Energy Ltd, Jaiprakash Associates Ltd, Jindal Steel and Power Ltd (JSPL) and GMR Group. “There is a concern that any construction on the Brahmaputra will affect hydropower generation in Arunachal Pradesh," said Union power secretary H.S. Brahma. “While 60% of the water in the Brahmaputra comes from India, 40% comes from Tibet. We have to study the impact." There is evidence that China is building a number of projects on the Brahmaputra, said a top official at the ministry of water resources who did not want to be identified. “While we expect minimal effect on Assam, hydropower generation on upstream projects in Arunachal Pradesh will get affected," the official added. “While the issue has been taken up with China, it says it has no (such) plans." India’s foreign secretary Nirupama Rao had said on 4 November that China had denied it was building a dam on the Brahmaputra. She was responding to a question on the reported construction at the Zangmu site on the Chinese side of the Brahmaputra, which was confirmed by the National Remote Sensing Agency, according to media reports. “What I want to say is that this matter has been taken up not just once, but on a number of occasions with China, and China has consistently denied that it is engaged in any such construction activity on the Brahmaputra," Rao said. The Chinese embassy in New Delhi did not reply to email queries from Mint on the issue. Geopolitical concerns over the sharing of river water make hydropower projects a major challenge, said K. Ramanathan, distinguished fellow at The Energy and Resources Institute. “Projects in Arunachal are anyway difficult to execute. There is a veil of secrecy about the availability of water from international rivers," he said. “With China planning to divert Brahmaputra water, there will be an impact. How much will be affected is difficult to say. The way forward will be expediting the construction of projects in the North-East over the rivers originating in China to establish prior user commitment." Mint had reported on 21 March that the Planning Commission had recommended the accelerated construction of hydropower projects in the North-East on rivers originating in China to establish a certain degree of prior use claim. According to international laws, having a prior use claim strengthens a country’s claim. S.K. Garg, chairman and managing director of NHPC, said: “We will have to study the impact (of the Chinese dam). It is too early to say anything on this issue at this point of time." 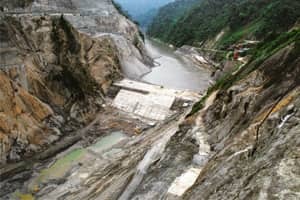 NHPC plans to develop hydropower projects that will generate 6,500MW of power in the state; construction has already begun on the 2,000MW Subansiri lower project. While spokespersons from JSPL and GMR denied that water diversion in China would affect their projects as the rivers they are to be developed do not originate there, an R-Adag spokesperson declined to comment on the issue. Questions emailed to Jaiprakash Associates on 6 November remained unanswered at the time of filing this story. Hydropower projects are difficult to build as construction requires more specialized technology and design compared with thermal power projects. They also have to deal with delays in environmental clearances. The hydropower sector accounts for only 32,326MW of India’s 150,000MW power-generating capacity. The country plans to add another 16,501.17MW of total capacity by 2012.